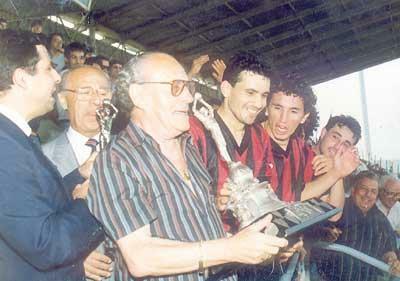 Hamrun Spartans president Victor Tedesco holds the FA Trophy after his team beat Valletta 2-1 in a replay in season 1991-1992. The 1991-92 FA Trophy was full of thrills and excitement. That year, the knockout was open only to the 10 clubs in the Premier Division. This made the competition more exclusive and much more interesting. The competition could not have begun on a better note. Floriana and Hibernians provided their supporters with a sound display of attacking football, typical of knockout ties. The game ended in a 1-1 draw and had to go to extra-time when Kim Wright scored the winning goal for Floriana. In the other preliminary round match, Sliema Wanderers ousted neighbours St Andrews with a goal scored in the 70th minute by John Caruana. The hard-earned victory earned the Blues a place in the quarter-finals against Hamrun Spartans. Though not exactly a classic, this match fully lived up to expectations. It was a thriller all the way and two hours of gruelling football were not enough to change the 2-2 deadlock. Thus, it was the penalty shoot-out that saw the Spartans moving into the last eight at Sliema's expense. In the other quarter-finals, Rabat just managed to dispose of Birkirkara in extra-time, Floriana were rather lucky to eliminate Mqabba, and Valletta went on a goal spree against Zurrieq (9-2). In the first semi-final, Hamrun beat Floriana 2-0. The Greens, however, had only themselves to blame for going out of the competition. Time and again, they created good scoring chances but poor finishing ruined all their good work. In the other semi-final, Valletta had the better of Rabat 3-1 and though the Citizens were tactically superior, the Magpies never gave up trying. Therefore, the stage was set for one of the most thrilling finals in the history of the competition. The final was held on June 7, 1992. It was a game that left the record crowd on tenterhooks until the final whistle. Stefan Sultana opened the scoring for the Spartans with a well-taken penalty. Valletta hit back and their efforts were rewarded with another penalty. Kris Laferla took the kick and scored to the delight of the City supporters. Play continued to fluctuate from one end of the pitch to the other until the 69th minute when Jesmond Zerafa scored to put the Whites on velvet. Hamrun reacted immediately and Valletta's fort was put under intense pressure. Nevertheless, as the minutes went by, the Citizens grew bolder and slowly came out of their defensive shell. With only seconds left from the end, it seemed all over for the Spartans. However, just before the final whistle, with the City fans already celebrating on the touchline, Ivan Zammit grabbed a dramatic equal-iser for the Spartans. The City clan was struck dumb but there was nothing left to do but play extra time. The extra half-hour was played at a frantic pace. The first half had barely started when Zarb put Valletta back in front. For a moment, the Spartans were knocked off their stride, but they were not beaten yet. Showing a rare mixture of grit and determination they stormed back into the game to hit in the equaliser through Joe Brincat and force a replay. The match attracted another huge crowd to the National Stadium, although it was played in midweek. The expectations were high and the atmosphere electric. Everything pointed to another titanic battle and again the match turned out to be a classic. Hamrun drew first blood when Sultana hit home in the 16th minute. Four minutes later, the same player made it 2-0 amidst indescribable scenes of joy among the Spartans supporters. After the interval, Valletta went all out to draw level. Zarb reduced the arrears right at the start of the second period and this prompted the Citizens to increase the pressure. Their efforts, however, proved futile and it was Hamrun who inscribed their name on the FA Trophy for the sixth time in their history. Hamrun: Mallia, Cassar (Mamo), Camilleri, Grech, Fenech (Cutajar), Vella, Zammit, Micallef, Brincat, Degiorgio, Sultana. Valletta: Cini, Mackay, Briffa, Laferla, Sciberras, Populin, G. Agius, Saliba, Camilleri (C. Agius), Zarb, Zerafa. Scorers: Sultana (HS) 2; Zarb (V).